Once your organization achieves full compliance, the next step may be to explore corporate asset recovery services and work to recover property and assets that may belong to your company. Each year in the United States, more than $5 billion is escheated to the states. Nationwide, the total value of escheated properties in state custody is approximately $35-40 billion – and less than half will ever be reunited with rightful owner.  Even more unclaimed property sits dormant at government agencies, counties, municipalities and at other corporations. As a result of this surplus of unclaimed property, there is a tremendous opportunity for companies to conduct a corporate asset recovery program and recoup potential property and funds belonging to them. Companies with a long history of multiple mergers or acquisitions, name changes, and/or extensive business-to-business dealings should take special notice, as each of these factors can contribute to the likelihood that unclaimed assets are available. Asset recovery companies, such as Keane, can work with you to locate these assets – which can often be taken as income, directly – and positively – impacting your company’s bottom line. Keane’s asset recovery services group has an excellent success rate for rapidly recovering assets and capital for corporations large and small. Our corporate asset recovery services team researches and recovers unclaimed funds on behalf a variety of companies that are both local and national in scope. We utilize our relationships, research teams, and proprietary databases. We also search state offices and the court system, locating revenue sources from overlooked or unknown items that may have been reported many years ago. Our team’s expertise, combined with our advanced technology systems and research tools, enables us to create solutions specific to your needs. Our processes seamlessly integrate into your operation. The Keane team customizes each component to ensure the most effective execution and highest success levels based on your corporate processes, team structure, and preferences. In addition to seeing significant recoveries, our detailed reporting will ensure you are informed of our progress every step of the way. If you still have questions or are interested in partnering with Keane for your asset recovery needs, please contact us for additional information.